When you restore data from an encrypted backup, Veeam Agent for Linux performs data decryption automatically in the background or requires you to specify a password. If encryption keys required to unlock the backup file are available in the Veeam Agent for Linux database, that is, if you encrypt and decrypt the backup file on the same Veeam Agent computer, you do not need to specify the password. 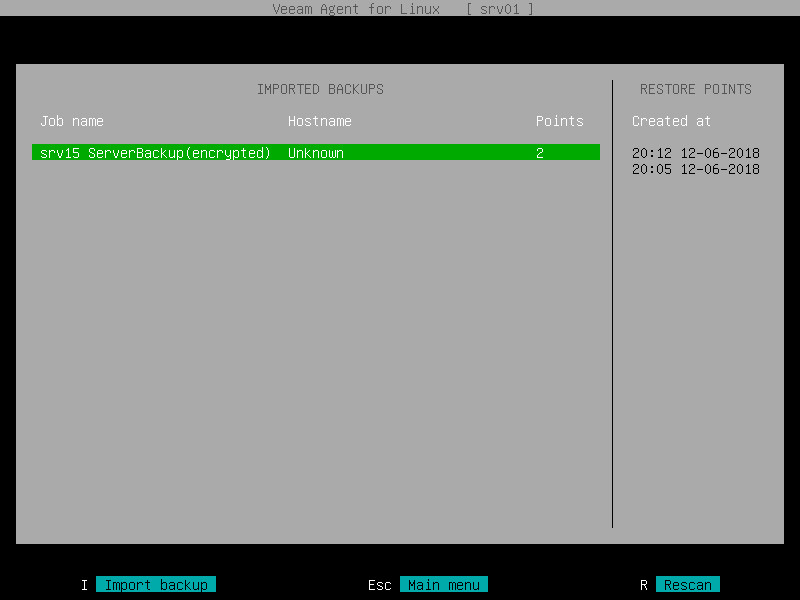 Veeam Agent for Linux uses keys from the database to unlock the backup file. Data decryption is performed in the background, and data restore from the encrypted backup does not differ from that from an unencrypted one. If encryption keys are not available in the Veeam Agent for Linux database, you need to provide a password to unlock the encrypted file. The password must be the same as the password that was used to encrypt the backup file. If the password has changed once or several times, you need to specify the latest password. In Veeam Agent for Linux, you can use the latest password to restore data form all restore points in the backup chain, including restore points that were encrypted with an old password and restore points that were created before you have enabled the encryption option for the job. The process of unlocking an encrypted backup file differs depending on what Veeam Agent for Linux user interface you use for data restore. If you want to perform file-level restore from an encrypted backup that was created on another Veeam Agent computer, launch the Veeam Agent for Linux control panel with the veeam or veeamconfig ui command. To learn more, see Restoring Files and Folders. If you want to perform volume-level restore or file-level restore recovery from an encrypted backup, boot from the Veeam Recovery Media and launch the necessary data restore wizard. To learn more, see Restoring from Veeam Recovery Media. Follow the steps of the wizard to specify where the encrypted backup file that you plan to use for restore resides. If the backup file resides in a remote location, select the backup location type and specify settings to connect to the backup location. Select the encrypted backup and restore point from which you want to restore data. Veeam Agent for Linux will display the Encryption window. Enter the password for the backup file. In the Hint field of the Encryption window, Veeam Agent for Linux displays a hint for the password that was used to encrypt the backup file. Use the hint to recall the password. If you changed the password one or several times while the backup chain was created, you need to specify the latest password. In Veeam Agent for Linux, you can use the latest password to restore data form all restore points in the backup chain, including those restore points that were encrypted with an old password. If you enter correct password, Veeam Agent for Linux will decrypt the backup metadata. You will be able to continue the restore operation in a regular manner. 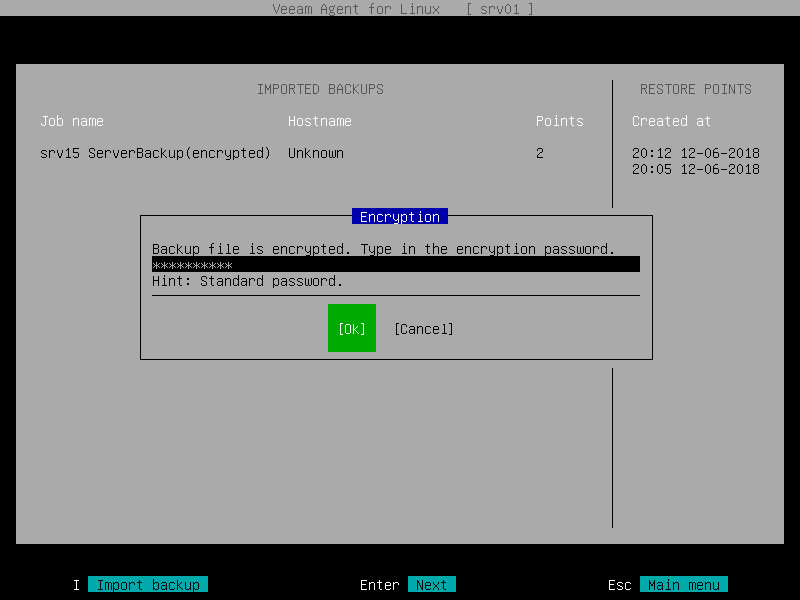 Import the encrypted backup file to the Veeam Agent for Linux database. To learn more, see Importing Encrypted Backups. Perform the necessary restore operation in a regular manner. To learn more, see Restoring Volumes with Command Line Interface and Restoring Files and Folders with Command Line Interface.